I was asked by Greg Stroud of SECoast to look at HSR between New Rochelle and Greens Farms. On this segment (and, separately, between Greens Farms and Milford), 300+ km/h HSR is not possible, but speedups and bypasses in the 200-250 area are. The NEC Future plan left the entire segment from New York to New Haven as a question mark, and an inside source told me it was for fear of stoking NIMBYism. Nonetheless, SECoast found a preliminary alignment sketched by NEC Future and sent it to me, which I uploaded here in Google Earth format – the file is too big to display on Google Maps, but you can save and view it on your own computer. Here’s my analysis of it, first published on SECoast, changed only on the copy edit level and on English vs. metric units. The tl;dr version is that speeding up intercity trains (and to some extent regional trains too) on the New Haven Line is possible, and requires significant but not unconscionable takings. The target trip time between New York and New Haven is at the lower end of the international HSR range, but it’s still not much more than a third of today’s trip time, which is weighed down by Amtrak/Metro-North agency turf battles, low-quality trains, and sharp curves. The New Haven Line was built in the 1840s in hilly terrain. Like most early American railroads, it was built to low standards, with tight curves and compromised designs. Many of these lines were later replaced with costlier but faster alignments (for example, the Northeast Corridor in New Jersey and Pennsylvania), but in New England this was not done. With today’s technology, the terrain is no problem: high-speed trains can climb 3.5-4% grades, which were unthinkable in the steam era. But in the 170 years since the line opened, many urban and suburban communities have grown along the railroad right of way, and new construction and faster alignments will necessarily require significant adverse impacts to communities built along the Northeast Corridor. This analysis will explain some of the impacts and opportunities expanding and modernizing high-speed rail infrastructure on or near the New Haven Line—and whether such an investment is worthwhile in the first place. There are competing needs: low cost, high speed, limited environmental impact, good local service on Metro-North. High-speed rail can satisfy each of them, but not everywhere and not at the same time. The Northeast Corridor Future (NEC Future) preferred alternative, a new plan by the Federal Railroad Administration to modernize and expand rail infrastructure between Washington and Boston, proposes a long bypass segment parallel to the New Haven Line, between Rye and Greens Farms. The entire segment is called the New Rochelle-Greens Farms bypass; other segments are beyond the scope of this document. New Rochelle-Rye, the leadup to the bypass, where scheduling trains is the most difficult. Rye-Cos Cob, the first bypass. The Cos Cob Bridge, a decrepit bridge for which the replacement is worth discussing on its own. Cos Cob-Stamford, where the preferred alternative is a bypass, but a lower-impact option on legacy track is as fast and should be studied. Stamford-Darien, where another bypass is unavoidable, with significant residential takings, almost 100 houses in one possibility not studied in the preferred alternative. Norwalk-Greens Farms, a continuation of the Darien bypass in an easier environment. The impacts in question are predominantly noise, and the effect of takings. The main reference for noise emissions is a document used for California High-Speed Rail planning, using calibrated noise levels provided by federal regulators. At 260 km/h, higher than trains could attain in most of the segment in question, trains from the mid-1990s 45 meters away would be comparable to a noisy urban residential street; more recent trains, on tracks with noise barriers, would be comparable to a quiet urban street. Within a 50-meter (technically 150 feet) zone, adverse impact would require some mitigation fees. At higher speed than 260 km/h, the federal regime for measuring train noise changes: the dominant factor in noise emissions is now air resistance around the train rather than rolling friction at the wheels. This means two things: first, at higher speed, noise emissions climb much faster than before, and second, noise barriers are less effective, since the noise is generated at the nose and pantograph rather than the wheels. At only one place within the segment are speeds higher than about 260 km/h geometrically feasible, in Norwalk and Westport, and there, noise would need to be mitigated with tall trees and more modern, aerodynamic trains, rather than with low concrete barriers. This analysis excludes impact produced by some legacy trains, such as the loud horns at grade crossings; these may well go away in a future regulatory reform, as the loud horns serve little purpose, and the other onerous federal regulations on train operations are being reformed. But in any case, the mainline and any high-speed bypass would be built to high standards, without level crossings. Thus noise impact is entirely a matter of loud trains passing by at high speed. Apart from noise and takings, there are some visual impacts coming from high bridges and viaducts. For the most part, these are in areas where the view the aerials block is the traffic on I-95. Perhaps the biggest exception is the Mianus River, where raising the Cos Cob Bridge has substantial positive impact on commuter train operations and not just intercity trains. If all units are metric, and speed is in meters per second, this formula requires no unit conversion. But as is common in metric countries, I will cite speed in kilometers per hour rather than meters per second; 1 m/s equals 3.6 km/h. Lateral acceleration is the most important quantity to focus on. It measures centrifugal force, and has a maximum value for safety and passenger comfort. But railroads decompose it into two separate numbers, to be added up: superelevation (or cant), and cant deficiency (or unbalanced superelevation, or underbalance). Superelevation means banking the tracks on a curve. There is an exact speed at which trains can run where the centrifugal force exactly cancels out the banking, but in practice trains tend to run faster, producing additional centrifugal force; this additional force is called cant deficiency, and is measured as the additional hypothetical cant required to exactly balance. If a train sits still on superelevated track, or goes too slowly, then passengers will feel a downward force, toward the inside of the curve; this is called cant excess. On tracks with heavy freight traffic, superelevation is low, because slow freight trains would otherwise be at dangerous cant excess. But the New Haven Line has little freight traffic, all of which can be accommodated on local tracks in the off-hours, and thus superelevation can be quite high. Today’s value is 5” (around 130 mm), and sometimes even less, but the maximum regulatory value in the United States is 7” (around 180 mm), and in Japan the high-speed lines can do 200 mm, allowing tighter curves in constrained areas. Cant deficiency in the United States has traditionally been very low, at most 3” (75 mm). But modern trains can routinely do 150 mm, and Metro-North should plan on that as well, to increase speed. The Acela has a tilting mechanism, allowing 7”; the next-generation Acelas are capable of 9” cant deficiency (230 mm) at 320 km/h; this document will assume the sum total of cant and cant deficiency is 375 mm (the new Acela trainsets could do 200 mm cant deficiency with 175 mm cant, or Japanese trainsets could do 175 mm cant deficiency with 200 mm cant). This change alone, up from about 200 mm today, enough to raise the maximum speed on every curve by 37%. At these higher values of superelevation and cant deficiency, a curve of radius 800 meters can support 160 km/h. The introduction of high-speed rail between New York and New Haven requires making some changes to timetabling on the New Haven Line. In fact, on large stretches of track on this line, especially in New York State, the speed limit comes not from curves or the physical state of the track, but from Metro-North’s deliberately slowing Amtrak down to the speed of an express Metro-North train, to simplify scheduling and dispatching. This includes both the top speed (90 mph/145 km/h in New York State, 75 mph/120 km/h in Connecticut) and the maximum speed on curves (Metro-North forbids the Acela to run at more than 3”/75 mm cant deficiency on its territory). Run only two speed classes, slowing down intercity trains to the speed of express commuter trains. Run only two speed classes, making all commuter trains local. Expand the corridor to six tracks. Schedule trains of three different speed classes on just four tracks, with timed overtakes allowing faster trains to get ahead of slower trains at prescribed locations. The current regime on the line is option #1. Option #2 would slow down commuters from Stamford and points east too much; the New Haven Line is too long and too busy for all-local commuter trains. Option #3 is the preferred alternative; the problem there is the cost of adding tracks in constrained locations, which includes widening viaducts and rebuilding platforms. Option #4 has not been investigated very thoroughly in official documents. The reason is that timed overtakes require trains to be at a specific point at a specific time. Amtrak’s current reliability is too poor for this. However, future high-speed rail is likely to be far more punctual, with more reliable equipment and infrastructure. Investing in this option would require making some targeted investments toward reliability, such as more regular track and train maintenance, and high platforms at all stations in order to reduce the variability of passenger boarding time. Moreover, at some locations, there are tight curves on the legacy New Haven Line that are hard or impossible to straighten in any alignment without long tunnels. South of Stamford, this includes Rye-Greenwich. This means that, with new infrastructure for high-speed rail, the bypass segments could let high-speed trains overtake express commuter trains. The Rye-Greenwich segment is especially notable. High-speed rail is likely to include a bypass of Greenwich station. Thus, express commuter trains could stop at Greenwich, whereas today they run nonstop between Stamford and Manhattan, in order to give intercity trains more time to overtake them. A southbound high-speed trains would be just behind an express Metro-North train at Stamford, but using the much greater speed on the bypass, it would emerge just ahead of it at Rye. This segment could be built separately from the rest of the segment, from Stamford to Greens Farms and beyond, because of its positive impact on train scheduling. It is critical to plan infrastructure and timetable together. With a decision to make express trains stop at Greenwich, infrastructure design could be simpler: there wouldn’t be a need to add capacity by adding tracks to segments that are not bypassed. A junior consultant working on NEC Future who spoke to me on condition of anonymity said that there was pressure not to discuss fares, and at any rate the ridership model was insensitive to fare. However, this merits additional study, because of the interaction with commuter rail. If the pricing on high-speed rail is premium, as on Amtrak today, then it is unlikely there will be substantial high-speed commuting to New York from Stamford and New Haven. But if there are tickets with low or no premium over commuter rail, with unreserved seating, then many people would choose to ride the trains from Stamford to New York, which would be a trip of about 20 minutes, even if they would have to stand. High-speed trains are typically longer than commuter trains: 16 cars on the busier lines in Japan, China, and France, rather than 8-12. This is because they serve so few stops that it is easier to lengthen every platform. This means that the trains have more capacity, and replacing a scheduled commuter train with a high-speed train would not compromise commuter rail capacity. The drawback is that commuters are unlikely to ride the trains outside rush hour, which only lasts about 2 or 3 hours a day in each direction. In contrast, intercity passengers are relatively dispersed throughout the day. Capital investment, including infrastructure and train procurement, is based on the peak; reducing the ratio of peak to base travel reduces costs. The unreserved seat rule, in which there is a small premium over commuter rail for unreserved seats (as in Germany and Japan) and a larger one for reserved seats, is one potential compromise between these two needs (flat peak, and high-speed commuter service). The track between New Rochelle and Rye is for the most part straight. Trains go 145 km/h, and this is because Metro-North slows down intercity trains for easier dispatching. The right-of-way geometry is good for 180 km/h with tilting trains and high superelevation; minor curve modifications are possible, but save little time. The big item in this segment concerns the southern end: New Rochelle. At New Rochelle, the mainline branches in two: toward Grand Central on the New Haven Line, and toward Penn Station on the Hell Gate Line, used by Amtrak and future Penn Station Access trains. This branching is called Shell Interlocking, a complex of track switches, all at grade, with conflicts between trains in opposite directions. All trains must slow down to 30 mph (less than 50 km/h), making this the worst speed restriction on the Northeast Corridor outside the immediate areas around major stations such as Penn Station and Philadelphia 30th Street Station, where all trains stop. The color coding is, orange is viaducts (including grade separations), red is embankments, and teal is at-grade. This is the Northeast Corridor, continuing south on the Hell Gate Line to Penn Station, and not the Metro-North New Haven Line, continuing west (seen in natural color in the photo) to Grand Central. A Shell fix could also straighten the approach from the south along the Hell Gate Line, which is curvy. The curve is a tight S, with individual curves not too tight, but the transition between them constraining speed. The preferred alignment proposes a fix with a kilometer of curve radius, good for 180 km/h, with impact to some industrial sites but almost no houses and no larger residential buildings. It is possible to have tighter curves, at slightly less cost and impact, or wider ones. Slicing a row of houses in New Rochelle, east of the southern side of the S, could permit cutting off the S-curve entirely, allowing 240 km/h; the cost and impact of this slice relative to the travel time benefit should be studied more carefully and compared with the cost per second saved from construction in Connecticut. The main impact of high-speed rail here on ordinary commuters is the effect on scheduling. With four tracks, three train speed classes, and heavy commuter rail traffic, timetabling would need to be more precise, which in turn would require trains to be more punctual. In the context of a corridor-wide high-speed rail program, this is not so difficult, but it would still constrain the schedule. Without additional tracks, except on the bypasses, there is capacity for 18 peak Metro-North trains per hour into New York (including Penn Station Access) and 6 high-speed trains. Today’s New Haven Line peak traffic is 20 trains per hour (8 south of Stamford, 12 north of which 10 run nonstop from Stamford to Manhattan), so this capacity pattern argues in favor of pricing trains to allow commuters to use the high-speed trains between Stamford and New York. Rye is the first place, going from the south, where I-95 is straighter than the Northeast Corridor. This does not mean it is straight: it merely means that the curves on I-95 in that area are less sharp than those at Rye, Port Chester, and Greenwich. Each of these three stations sits at a sharp S-curve today; the speed zone today is 75 mph (120 km/h), with track geometry that could allow much more if Metro-North accepted a mix of trains of different speed, but Rye and Greenwich restrict trains to 60 mph/95 km/h, and Port Chester to 45 mph/70 km/h at the state line. The segment between the state line and Stamford in particular is one of the slowest in the corridor. 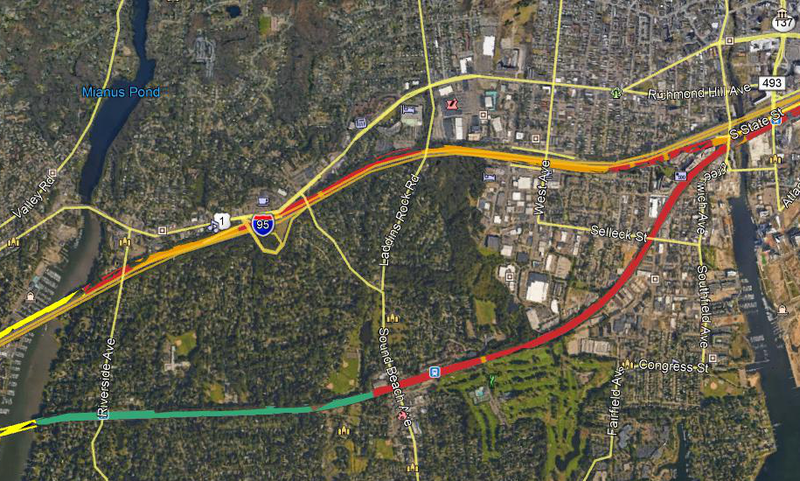 As a result, the NEC Future plan would bypass the legacy line there alongside the Interstate. Currently, the worst curve in the bypassed segment, at Port Chester, has radius about 650 meters, with maximum speed much less than today’s trains could do on such a curve because of the sharp S. At medium and high speed, it takes a few seconds of train travel time to reverse a curve, or else the train must go more slowly, to let the systems as well as passengers’ muscles adjust to the change in the direction of centrifugal force. At Rye, the new alignment has 1,200-meter curves, with gentle enough S to allow trains to fully reverse, without additional slowdowns; today’s tracks and trains could take it at 140 km/h, but a tilting train on tracks designed for higher-speed travel could go up to 195. Within New York State, the bypass would require taking a large cosmetics store, and some houses adjacent to I-95 on the west; a few townhouses in Rye may require noise walls, as they would be right next to the right-of-way where trains would go about 200-210 km/h, but at this speed the noise levels with barriers are no higher than those of the freeway, so the houses would remain inhabitable. In Connecticut, the situation is more delicate. When the tracks and I-95 are twinned, there is nothing in between, and thus the bypass is effectively just two extra tracks. To the south, just beyond the state line, the situation is similar to that of Rye: a few near-freeway houses would be acquired, but nothing else would, and overall noise levels would not be a problem. But to the north, around Greenwich station, the proposed alignment follows the I-95 right-of-way, with no residential takings, and one possible commercial taking at Greenwich Plaza. This alignment comes at the cost of a sharp curve: 600 meters, comparable to the existing Greenwich curve. This would provide improvements in capacity, as intercity trains could overtake express commuter trains (which would also stop at Greenwich), but not much in speed. Increasing speed requires a gentler curve than on I-95; eliminating the S-curve entirely would raise the radius to about 1,600 meters, permitting 225 km/h. This has some impact, as the inside of the curve would be too close to the houses just south of I-95, requiring taking about seven houses. However, the biggest drawback of this gentler curve is cost: it would have to be on a viaduct crossing I-95 twice, raising the cost of the project. It is hard to say by exactly how much: either option, the preferred one or the 225 km/h option, would involve an aerial, costing about $100 million according to FRA cost items, so the difference is likely to be smaller than this. It is a political decision whether saving 30 seconds for express trains is worth what is likely to be in the low tens of millions of dollars. 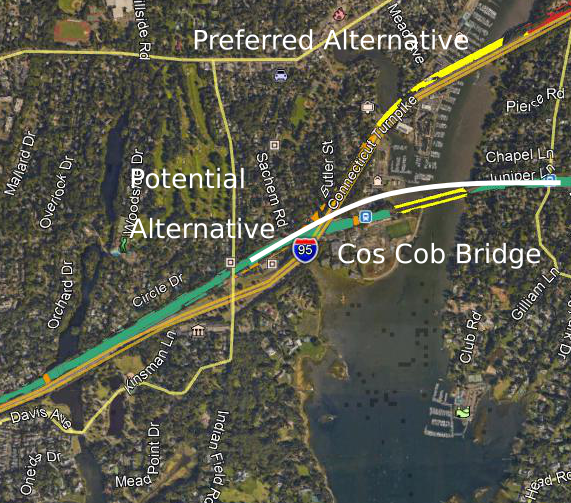 The Cos Cob Bridge restricts the trains, in multiple ways. As a movable bridge, it is unpowered: trains on it do not get electric power, but must instead coast; regular Metro-North riders are familiar with the sight of train lights, air conditioning, and electric sockets briefly going out when the train is on the bridge. It is also old enough that the structure itself requires trains to go more slowly, 80 km/h in an otherwise 110 km/h zone. Because of the bridge’s age and condition, it is a high priority for replacement. One cost estimate says that replacing the bridge would cost $800 million. The Regional Plan Association estimates the cost of replacing both this bridge and the Devon Bridge, at the boundary between Fairfield and New Haven Counties, at $1.8 billion. The new span would be a higher bridge, fully powered, without any speed limit except associated with curves; Cos Cob station has to be rebuilt as well, as it is directly on the approaches, and it may be possible to save money there (Metro-North station construction costs are very high—West Haven was $105 million, whereas Boston has built infill stations for costs in the teens). The color coding is the same as before, but yellow means major bridge. White is my own drawing of an alternative. The radius of the curve would be 1,700 meters. A tilting train could go at 235 km/h. Commuter rail would benefit from increased speed as well: express trains could run at their maximum speed, currently 160 km/h, continuing almost all the way east to Stamford. The cost of this in terms of impact is the townhouses just north of the Cos Cob station: the viaduct would move slightly north, and encroach on some, possibly all, of the ten buildings. Otherwise, the area immediately to the north of the station is a parking lot. The longer, wider curve alternative can be widened even further. In that case, there would be more impact on the approaches, but less near the bridge itself, which would be much closer in location to the current bridge and station. This option may prove useful if one alignment for the wider curve turns out to be infeasible due to either unacceptable impact to historic buildings or engineering difficulties. The curve radius of this alternative rises to about 3,000 meters, at which point the speed limit is imposed entirely by neighboring curves in Greenwich and Stamford; trains could go 310 km/h on a 3,000-meter curve, but they wouldn’t have room to accelerate to that speed from Greenwich’s 225 km/h. The main benefit of the I-95 option is that it offers additional bypass tracks for the New Haven Line. Under this option, there is no need for intercity trains and express commuter trains to share tracks anywhere between Rye and Westport. However, the legacy alignment has multiple other benefits. First, it has practically no additional impact. Faster trains would emit slightly more noise, but high-speed trains designed for 360 km/h are fairly quiet at 210. In contrast, the I-95 alignment requires a bridge over the Greenwich Water Club, some residential takings in Cos Cob, and possibly a few commercial takings in Riverside. In either case, one additional investment in Stamford is likely necessary, benefiting both intercity and commuter rail travelers: grade-separating the junction between the New Canaan Branch and the mainline. Without at-grade conflicts between opposing trains on the mainline and the New Canaan Branch, scheduling would be simpler, and trains to and from New Canaan would not need to use the slow interlocking at Stamford station. The existing route into Stamford already has the potential to be fast. The curves between the Mianus and Stamford station are gentle, and even the S-curve on the approach to Stamford looks like a kilometer in radius, good enough for 180 km/h on a tilting train with proper superelevation. Between New York and Stamford, the required infrastructure investments for high-speed rail are tame. Everything together except the Mianus crossing should be doable, based on FRA cost items, on a low 9-figure budget. East of Stamford, the situation is completely different. There are sharp curves periodically, and several in Darien and Norwalk are too tight for high-speed trains. 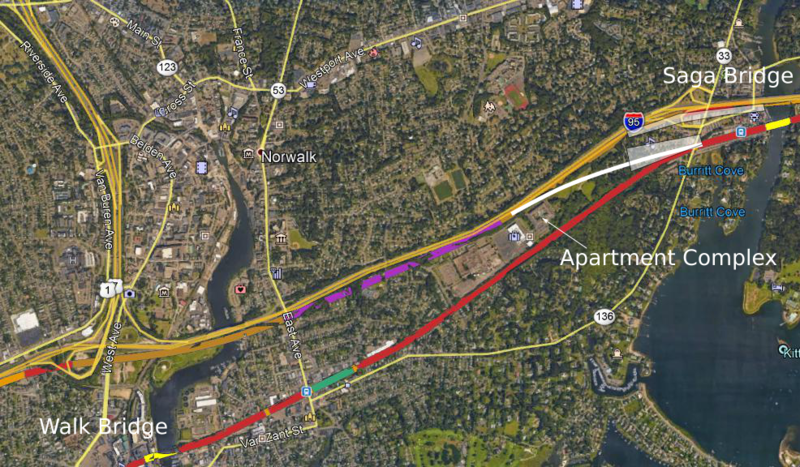 What’s more, I-95 is only available as a straight alternative right-of-way in Norwalk. In Darien, and in Stamford east of the station, there is no easy solution. Everything requires balancing cost, speed, and construction impact. The one saving grace is that there is much less commuter rail traffic here than between New York and Stamford. With bypasses from Stamford until past Norwalk, only a small number of peak express Metro-North trains east of Greens Farms would ever need to share tracks with intercity trains. Thus the scheduling is at least no longer a problem. The official plan from NEC Future is to hew to I-95, with all of its curves, and compromise on speed. The curve radius appears to be about 700-750 meters through Stamford and most of Darien, good for about 95 mph over a stretch of 5.5 miles. This is a compromise meant to limit the extent of takings, at the cost of imposing one of the lowest speed limits outside major cities. While the official plan is feasible to construct, the sharp curves suggest that if Amtrak builds high-speed rail in this region, it will attempt a speedup, even at relatively high cost. The preferred alignment stays to the south of the Turnpike. This is the residential side; even with tight curves, some residential takings are unavoidable, about 20 houses. Going north of I-95 instead requires a few commercial takings, including some auto shops, and one or two small office buildings east of Old Kings Highway, depending on curve radius. Construction costs here are slightly higher, because easing one curve would require elevated construction above I-95, as in one of the Greenwich options above, but this is probably a matter of a few tens of millions of dollars. The main impact, beyond land acquisition cost, is splitting Noroton in half, at least for pedestrians and cyclists (drivers could drive in underpasses just as they do under highways). Conversely, the area would be close enough to Stamford, with its fast trains to New York, that it may become more desirable. This is especially true for takings within Stamford. However, Darien might benefit as well, near Noroton Heights and Darien stations, where people could take a train to Stamford and change to a high-speed train to New York or other cities. As in Greenwich, it is a political decision how much a minute of travel time is worth. Darien houses are expensive; at the median price in Noroton, 60-80 houses would be $70-90 million, plus some extra for the office buildings. Against this extra cost, plus possible negative impact on the rest of Noroton, are positive impacts coming from access, and a speedup of 70-90 seconds for all travelers from New York or Stamford to points north. In Norwalk, I-95 provides a straight right-of-way for trains. This is the high-speed rail racetrack: for about ten kilometers, until Greens Farms, it may be possible for trains to run at 270-290 km/h. Three question marks remain about the preferred alignment. The first question is, which side of the Turnpike to use? The preferred alignment stays on the south side. This limits impact on the north side, which includes some retail where the Turnpike and U.S. 1 are closely parallel, near the Darien/Norwalk boundary; a north side option would have to take it. But the preferred alignment instead slices Oyster Shell Park. A third option is possible, transitioning from the north to the south side just east of the Norwalk River, preparing to rejoin the New Haven Line, which is to the south of I-95 here. The second question is, why is the transition back to the New Haven Line so complex? 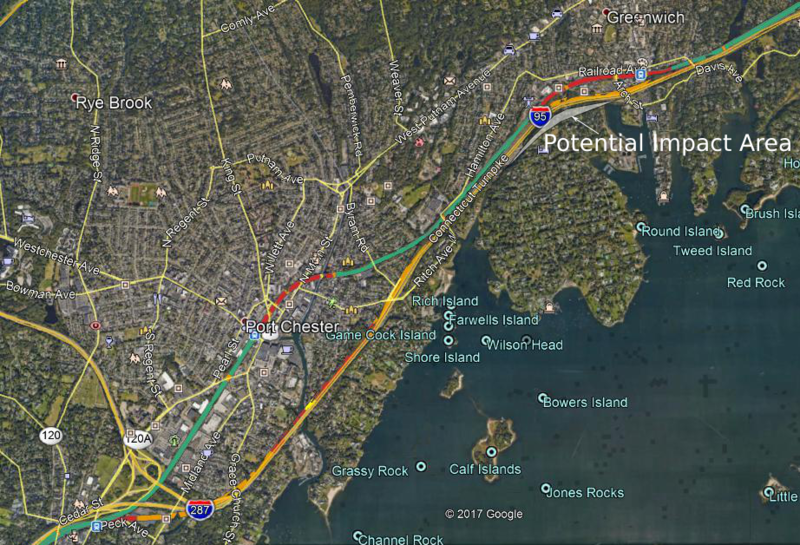 The preferred alignment includes a tunnel in an area without any more impacted residences than nearby segments, including in Greenwich and Darien. It also includes a new Saga Bridge, bypassing Westport, with a new viaduct in Downtown Westport, taking some retail and about six houses. 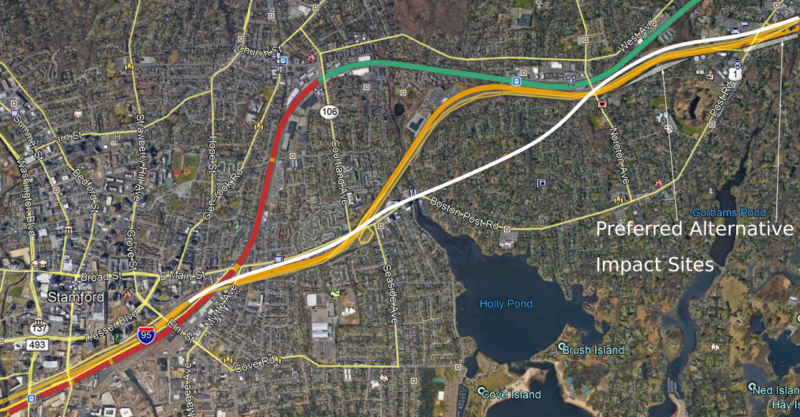 An alternative would be to leverage the upcoming Saga Bridge reconstruction, which the RPA plan mentions is relatively easy ($500 million for Saga plus Walk, on the Norwalk River, bypassed by any high-speed alignment), and transition to the legacy alignment somewhat to the west of Westport. A complicating factor for transitioning west of Westport is that the optimal route, while empty eight years ago, has since gotten a new apartment complex with a few hundred units, marked on the map. Alternatives all involve impact to other places; the options are transitioning north of the complex, taking about twenty units in Westport south of the Turnpike and twenty in Norwalk just north of it. The area has a prominent S-curve, and some compromises on curve radius are needed. But the preferred alternative doesn’t seem to straighten it. Instead, it builds an interlocking there, with the bypass from Darien and points west. While that particular area has little impact (the preferred alignment transitions in the no man’s land between the New Haven Line and the Turnpike), the area is constrained and the interlocking would be expensive. No matter what happens, the racetrack ends at Greens Farms. The existing curve seems to have a radius of about a kilometer or slightly more, good for about 190 km/h, and the best that can be done if it is straightened is 1,300-1,400 meters, good for about 200 km/h. These questions may well have good answers. Unlike in Darien, where all options are bad, in Norwalk and Westport all options are at least understandable. But it’s useful to ask why go south of the Turnpike rather than north, and unless there is a clear-cut answer, both options should be studied in parallel. Based on a Patreon poll, the top two priorities for this blog for critiquing the RPA Fourth Regional Plan are its mess of the LGA connection and the Astoria Line, and the proposed commuter rail trunk line on Third Avenue. The third priority is multi-tracking existing lines and timetable-infrastructure integration. A north-south trunk line under Third Avenue, with an onward connection to Brooklyn. Stops at 125th, 86th, 42nd, 31st, 14th, Canal, and Fulton Street. Two tunnels to New Jersey (in addition to Gateway), at 57th and Houston Streets, using Third Avenue to connect between them. A tunnel directly under the Harlem Line in the Bronx, called an express tunnel but making more stops, with infill at 138th and 149th Street, to intersect the 6 and 2/5 trains respectively. I contend that all three elements are problematic, and should not be built without major changes. The RPA plan bypasses the existing tracks to Grand Central entirely. This simplifies scheduling, in the sense that all trains using Third Avenue are captive to the reorganized system from the start. It also serves the Upper East Side and East Harlem slightly better: there is more population density east of Third Avenue than west of it, so it materially benefits riders to have a commuter rail station on Third rather than on Park, where the current line goes. Unfortunately, these advantages are swamped by the fact that this means the Fourth Regional Plan is proposing about 8 kilometers of tunnel, from 138th Street to 42nd, redundant with the existing Grand Central approach. At the cost I think is appropriate for urban tunnels, this is around $2 billion. At what New York seems to actually spend, start from $13 billion and go up. Because this trunk line would have to be built from scratch, it also has necessarily limited capacity. The Grand Central approach has four tracks; Third Avenue is as far as I can tell based on the plan just two. Many trains on the Hudson and New Haven Lines would need to keep terminating at the existing Grand Central station, with no through-service; any transfer to the Third Avenue trunk would involve walking a long block between Park and Third Avenues, 310 meters apart. The capacity limitation, in turn, forces some reverse-branching onto Metro-North, on top of that coming from future Penn Station Access lines (the connections from the New Haven and Hudson Lines to Penn Station, depicted on both the RPA map and my map). It is possible to avoid this by connecting just one of Metro-North’s line to the new trunk, probably the Harlem Line, and then make passengers from the other two lines go to the existing Grand Central. But at least as depicted in the map, this service pattern seems unlikely: the High Bridge infill stop suggests some Hudson Line trains would go to the trunk, too. Unfortunately, even without reverse-branching, service would not be great, since connections between the old and new system (especially with the Hudson Line) would require a long walk at 125th Street or Grand Central. The long walk is also a problem for the trunk line from Grand Central south. According to OnTheMap, the center of gravity of Midtown jobs seems to be between Fifth and Sixth Avenues, with few jobs east of Third. While this trunk line is good for scooping Upper East Side passengers, it isn’t good for delivering them to their exact destination. The RPA stop spacing is too local. The 4 and 5 trains stop at 125th, 86th, 59th, Grand Central, Union Square, City Hall, and Fulton Street. It’s for this reason that my map’s Line 4 is so express, stopping only at 125th Street, Grand Central, Union Square, and Fulton Street: the line parallels the Lexington Avenue Line so closely that it should offer a different stopping pattern. For the same reason, observe that I do not include any infill on the LIRR Main Line west of Jamaica, where is it closely parallel to the Queens Boulevard Line with its E and F express trains; on lines not so close to express subways, I have extensive infill instead. In contrast, the RPA wants trains to make the same number of stops between Harlem and Lower Manhattan as the 4 and 5 subway lines, just at slightly different locations: 31st instead of 59th, Canal instead of City Hall. The Canal Street location is understandable. Chinatown is a major destination, overshadowed by Midtown and Lower Manhattan but important in its own right; the Canal Street complex on the 6, N/Q/R/W, and J/Z is the 18th busiest subway station in New York on weekdays and the 11th busiest on weekends. It’s also an intersection point between the north-south trunk line and the N/Q trains (in addition to Union Square) and the J/Z trains (in addition to Fulton Street). I think it’s overall not a good idea to include this location, because the 4/5/6 exist, and the connections to the N/Q and J/Z also exist elsewhere, but I think the alternatives analysis for this project should include this station as an option. In contrast, 31st Street is inexcusable. On the surface, the rationale for it is clear: provide a transfer point with the east-west tunnels feeding Penn Station. In practice, it is weak. The area is just frustratingly out of walking range from Midtown jobs for train riders. The transfer is good in theory, but in practice requires a new tunnel from Penn Station to Long Island, one that the RPA included because Long Island’s turf warriors wanted it despite complete lack of technical merit; the cost of this tunnel, according to RPA head Tom Wright, would be $7 billion. The only reason to include this connection in the first place is that RPA decided against a connection between Grand Central and Penn Station. In New Jersey, the RPA believes in making no little plans, proposing three two-track Hudson crossings: Gateway, and two new tunnels, one connecting Bergen and Passaic Counties with 57th Street, and one from Hoboken to Houston Street. Tunnels in the general vicinity of these are good ideas. But in this plan, there’s one especially bad element: those tunnels link into the same Third Avenue trunk line. The RPA has a tendency, going back to at least the Third Regional Plan, to hang many elements on one central piece of infrastructure. The Third Plan proposed Second Avenue Subway as a four-track line, with many branches hitting all the other priorities: regional rail, an express rail connection to JFK, more lines in Brooklyn and the Bronx – see schematic on PDF-p. 13 of the executive summary and more detail on PDF-pp. 204-207 of the full plan. Most of these elements were good on their own, but the connection to Second Avenue Subway made them more awkward, with extensive conventional- and reverse-branching, and a JFK connection that would miss all Midtown hotels. On this plan, the need to link the new elements to the Third Avenue trunk leads to incoherent lines. High-frequency east-west trunks would make a lot of sense, complementing the north-south trunk, but instead of connecting Hoboken with Brooklyn and 57th Street with Long Island, both end up hooking to the north-south trunk and loop back to connect to each other. The proposed tunnels are already there, in the form of Gateway East and the trunk connection to Brooklyn, they just don’t align. Instead, the only east-west alignment that fully goes through is Gateway, with just one stop in Manhattan at Penn Station, except in the tunnel that also has an additional stop at off-Midtown 31st and 3rd. Between Grand Central and Wakefield, the Harlem Line has four tracks. In the South Bronx, the Hudson Line splits off, but the rest of the Harlem Line still has four tracks. Thus, the Bronx effectively has six tracks feeding four in Manhattan. It is this configuration that probably led the RPA to believe, in error, that two additional regional rail tracks in Manhattan were required. In this situation, it is unlikely there will ever be capacity problems on the Harlem Line in the Bronx – the bottleneck is further south. So why is the RPA proposing to add two more tracks to the Harlem Line, in a tunnel? In section 1 of this post, I defined the Third Avenue trunk’s unnecessary part as running from Grand Central to 138th Street, a total of 8 km. This tunnel, from 138th to the depicted northern end at Woodlawn, where the Harlem and New Haven Lines split, is 11 km. In a city with reasonable cost control, this should be around $2.5 billion. In New York, it would be much more – I can’t tell how much, since it is likely to be cheaper than the recent subway projects (Second Avenue Subway Phase 1, and the 7 extension), both of which were in Manhattan, but I would guess about $10 billion is in line with existing New York costs. Is there any valid reason to spend so much money on this tunnel? When I interviewed Tom Wright and Foster Nichols for my above-linked Streetsblog piece, I only saw the plans around Gateway, and was aware of the Third Avenue trunk idea but not of any of the details, so I never got a chance to ask about the Harlem Line express tunnel. So I can only guess at why the RPA would propose such a line: it got some pushback from the suburbs about wanting more express trains. The RPA could try to explain to suburbanites that the new system would not be so slow in the Grand Central throat: Metro-North does the 6.6 km from 125th to Grand Central in 10 minutes; the trains are capable of doing it in 5-6 minutes, but the last 15 blocks are excruciatingly slow, which slowness would be eliminated with any through-running, via the existing tunnels or via Third Avenue. Instead, for the same reason the organization caved to Long Island pressure to include Gateway East, it caved to Westchester pressure to include more express tracks. In reality, this tunnel has no merit at all. The way the existing suburban lines are laid out points to a clear service pattern: the Harlem Line on the local tracks, the New Haven Line on the express tracks (regardless if those trains run local or express on the New Haven Line farther out). Wakefield has four tracks and two platforms, but the Harlem and New Haven Lines split just short of it; perhaps new local platforms on the New Haven Line could connect to it, or perhaps the junction could be rebuild north of Wakefield, to enable transfers. With much of the New Haven Line capacity occupied by the reverse-branch to Penn Station Access, there wouldn’t be much of a capacity crunch on the express tracks; in a counterfactual in which reverse-branching is not a problem, some Harlem Line trains could even be routed onto the spare capacity on the express tracks. In the short run, the biggest thing the RPA is proposing for regional rail in New York is Gateway plus tie-ins. But this doesn’t really distinguish it from what the politicians want. The real centerpiece of the Fourth Plan, as far as regional rail goes, is the Third Avenue trunk line – even taking over some functionality of Second Avenue Subway, which the RPA proposes to not build south of 63rd Street. Unfortunately, this trunk line, while almost good, doesn’t quite work. It has 19 km of superfluous tunneling, from Grand Central to Woodlawn, adding no new service to the system, nor new connections to existing service, nor more capacity on lines that really need it. And it insists on linking new east-west tunnels beyond Gateway to the same trunk, ensuring that they couldn’t really work as east-west trunks from New Jersey to Brooklyn, Queens, and Long Island. In centering the trunk, the RPA is in effect ruining the possibility for additional trunks creating a bigger system. Building a north-south trunk leveraging the Harlem Line is a no-brainer. When I sent Yonah Freemark my first regional rail proposal in 2009, he responded with some draft he’d been working on, I think as an RPA intern, proposing a through-running network using the Harlem Line, with an extension to the south with an onward connection to Brooklyn much like the RPA’s current Third Avenue trunk south of 42nd Street. It’s something that different people with an interest in improving New York’s transit system could come up with independently. What matters is the details, and here, the Fourth Regional Plan falls short. The simplest train schedules are when every train makes every stop. This means there are no required overtakes, and no need for elaborate track construction except for reasons of capacity. In nearly all cities in the world, double-track mainlines with flying junctions for branches are enough for regional rail. Schedule complexity comes from branching and short-turns, and from the decision which lines to join together, but it’s then possible to run independently-scheduled lines, in which delays don’t propagate. I have worked on a map as part of a proposal for Boston, and there, the only real difficulty is how to optimize turnaround times.. But then there’s New York. New York is big enough that some trunk lines have and need four tracks, introducing local and express patterns. It also has reverse-branching on some lines: the Hudson Line and New Haven Line can serve either Penn Station or Grand Central, and there are key urban stations on the connections from either station to either line. The presence of Jamaica Station makes it tempting to reverse-branch the LIRR. Everything together makes for a complex map. I talked in 2014 about a five- or six-line system, and even there, without the local/express artifacts, the map looks complicated. Key decisions turn out to depend on rolling stock, on scheduling, and on decisions made about intercity rail fares. Here is what I drew last week. It’s a six-line map: lines 1 and 2 connect the Northeast Corridor on both sides plus logical branches and the Port Washington Branch of the LIRR, line 3 connects Hempstead with the Empire Corridor, line 4 connects the Harlem Line with the Staten Island Railway as a north-south trunk, line 5 connects the Erie Lines with the South Side LIRR lines, line 6 connects the Morris and Essex Lines with the LIRR Main Line. As I indicated in the map’s text, there are extra possible lines, going up to 9; if I revised the map to include one line, call it line 7, I’d connect the Northern Branch and West Shore Railroad to a separate tunnel under 43rd Street, going east and taking over the LIRR portions of line 3; then the new line 3 would connect the Hudson Line with the Montauk Line (both Lower Montauk and the Babylon Branch) via an East River Tunnel extension. The other options are at this point too speculative even for me; I’m not even certain about line 6, let alone line 7, let alone anything else. Intercity trains should use line 1 and not line 2. This is for two reasons: the curve radius between Penn Station and Grand Central might be too tight for Shinkansen trains; and the Metro-North trunk north of Grand Central has no room for extra tracks, so that the speed difference between intercity and regional trains (e.g. no stop at Harlem-125th) would limit capacity. For the same reason, line 1 only has a peak of 6 trains per hour on the Northeast Corridor east of where the Port Washington Branch splits. Since not many regional trains can go between New Rochelle and Penn Station on the Northeast Corridor, they should provide local service – express service should all go via Grand Central. There are long segments with only four tracks, requiring track sharing between intercity trains and express regional trains. These occur between New Rochelle and Rye, and between the end of six-tracking in Rahway and New Brunswick. See details and a sample schedule without new Hudson tunnels here. This encourages breaking service so that in the Manhattan core, it’s the local trains that share tunnel tracks with intercity trains, while express trains, which share tracks farther out, are less constrained. Express trains on the New Jersey side should stay express on the New Haven Line, to provide fast service on some plausible station pairs like Newark-Stamford or New Rochelle-New Brunswick. Flipping local and express service through Manhattan means through-riders would have to transfer at Secaucus (which is plausible) or Penn Station (which is a bad idea no matter how the station is configured). There should be infill stops in Hudson County: at Bergenline Avenue for bus connections and the high local population density, and just outside the portal, at the intersection with the Northern Branch. These stops should be on line 2 (where they can be built new) and not line 1 (where the tunnels would need to be retrofitted), and trains cannot skip them, so the line that gets these stops should run locals. It is not possible to satisfy all constraints simultaneously. Constraint 5 means that in New Jersey, line 2 should be local and line 1 should be express. Constraint 4 means the same should be true on the Metro-North side. But then constraints 2 and 3 encourage making line 1 local, especially on the Metro-North side. Something has to give. On the map, the compromise is that there’s an infill stop at Bergenline but not at the intersection with the Northern Branch (which further encourages detaching the Northern Branch from line 5 and making it part of a Midtown-serving line 7). So the line 2 express trains are one stop slower than the line 1 locals between Newark and New York, which is not a huge problem. The scheduling is still a problem, The four-track segment through Elizabeth between the six-track segments around Newark Airport and in Linden and Rahway has to be widened to six tracks; the four-track segment between the split with the North Jersey Coast Line and Jersey Avenue can mix three speed classes, with some express trains sharing tracks with intercity trains and others with local trains, but it’s not easy. 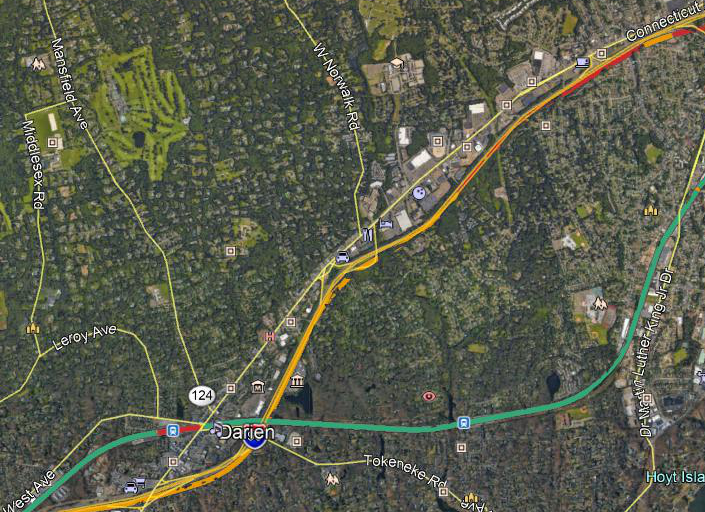 At least on the Connecticut side, any high-speed rail service requires so many bypasses along I-95 that those bypasses can be used for overtakes. At this point, it stops being purely about regional rail scheduling. The question of intercity rail fares becomes relevant: can people take intercity trains within the metro area with no or limited surcharge over regional trains? If so, then constraint 4 is no longer relevant: nobody would take regional trains on any segment served by intercity trains. In turn, there would be demand for local intercity trains, stopping not just at New Haven, New York, Newark, and Philadelphia, but also at Stamford, New Rochelle, perhaps Metropark (on new express platforms), and Trenton. In that case, the simplest solution is to flip lines 1 and 2 in New Jersey: line 1 gets the express trains to Trenton and the trains going all the way to Bay Head, line 2 gets the locals to Jersey Avenue, the Raritan Valley Line trains, and the Long Branch short-turns. This, in turn, depends on rolling stock. Non-tilting high-speed trains could easily permit passengers with unreserved seats to pay commuter rail fare. On tilting trains, this is dicier. In Germany, tilting trains with unreserved tickets (ICE-T) have a computer constantly checking whether the train is light enough to be allowed to tilt, and if it is too heavy, it shuts down the tilt mechanism. This should not be acceptable for the Northeast Corridor. This might not be necessary for tilting Shinkansen (which are so light to begin with this isn’t a problem, and they do sell unreserved tickets in Japan), but it’s necessary for Pendolinos and for the Avelias that Amtrak just ordered. Selling reserved tickets at commuter rail fares is another option, but it might not be plausible given peak demand into New York. The point of this exercise is that the best transit planning requires integrating all aspects: rolling stock, timetable, infrastructure, and even pricing. Questions like “can intercity trains charge people commuter rail fares for unreserved tickets?” affect express regional service, which in turn affects which branch connects to which trunk line. Ultimately, this is the reason I draw expansive maps like this one. Piecemeal planning, line by line, leads to kludges, which are rarely optimized for interconnected service. New York is full of examples of poor planning coming from disintegrated planning, especially on Long Island. I contend that the fact that, for all of the Gateway project’s scope creep and cost escalations, there’s no proposed stop at Bergenline Avenue, is a prime example of this planning by kludge. To build the optimal line 2, the region really needs to know where lines 3-6 should go, and right now, there’s simply none of this long-term planning. A few weeks ago, I published a piece in City Metric contrasting two ways of through-running regional rail, which I identify with the RER A and C in Paris. The RER C (or Thameslink) way is to minimally connect two stub-end terminals pointing in opposite directions. The RER A (or Crossrail) way is to build long city-center tunnels based on urban service demand but then connect to legacy commuter lines to go into the suburbs. Crossrail and the RER A are the two most expensive rail tunnels ever built outside New York, but the result is coherent east-west regional lines, whereas the RER C is considerably more awkward. In this post I’d like to explain what this means for New York. As I said in the City Metric piece, the current plans for through-running in New York are strictly RER C-style. There’s an RPA project called Crossrail New York-New Jersey, but the only thing it shared with Crossrail is the name. The plan involves new Hudson tunnels, but service would still use the Northeast Corridor and LIRR as they are (with an obligatory JFK connection to get the politicians interested). I alluded in the piece to RER A-like improvements that can be done in New York, but here I want to go into more detail into what the region should do. 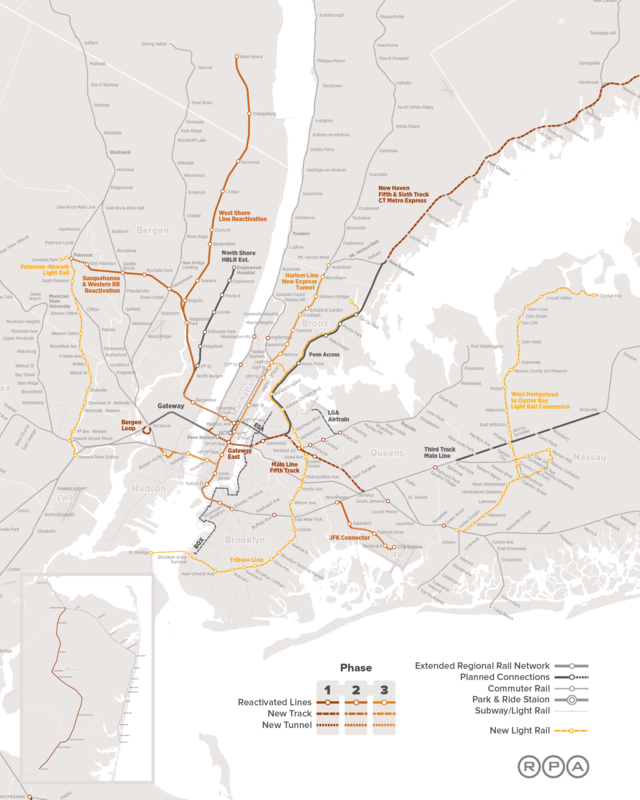 Regional rail in New York should serve not just Midtown but also Lower Manhattan. Owing to Lower Manhattan’s intense development in the early 20th century already, no full-size train stations were built there in the era of great urban stations. It got ample subway infrastructure, including by the Hudson Tubes (now PATH), but nothing that could be turned into regional rail. Therefore, regional rail plans today, which try to avoid tunneling, ignore Lower Manhattan entirely. The Institute for Rational Urban Mobility, longtime opponent of the original ARC project and supporter of through-running, even calls for new tunnels between Hoboken and Midtown, and not between Hoboken and Lower Manhattan. I went to an IRUM meeting in 2009 or 2010, when Chris Christie had just gotten elected and it was not clear what he’d do about ARC, and when people pitched the idea, I asked why not go Hoboken-Lower Manhattan. The reply was that it was beyond the scope of “must connect to Penn Station” and at any rate Lower Manhattan wasn’t important. In reality, while Midtown is indeed a bigger business district than Lower Manhattan, the job density in Lower Manhattan is still very high: 320,000 people working south of Worth Street in 1.9 km^2, compared with 800,000 in 4 km^2 in Midtown. Nothing in Ile-de-France is this dense – La Defense has 180,000 jobs and is said to have “over 800 jobs/ha” (link, PDF-p. 20), and it’s important enough that the RER A was built specifically to serve it and SNCF is planning a TGV station there. The legacy Northeast Corridor plus the Port Washington Branch, via the existing Hudson tunnels. More lines in New Jersey (some Northeast Corridor, some Morris and Essex) going to the New Haven Line via new Hudson tunnels and Grand Central. Some North Side LIRR lines (presumably just Hempstead and the Central Branch) to the Hudson Line via Penn Station and the Empire Connection; some LIRR trains should terminate at Penn Station, since the Hudson Line can’t support as much traffic. The Harlem Line connecting to the Staten Island Railway via Lower Manhattan and a Staten Island-Manhattan tunnel, the most controversial piece of the plan judging by comments. The New Jersey lines inherited from the Erie Railroad (including the Northern Branch) to the South Side LIRR (to Far Rockaway, Long Beach, and Babylon) via Lower Manhattan. More North Side LIRR lines (probably the Ronkonkoma and Port Jefferson branches) to Grand Central via East Side Access. The Lower Manhattan lines, numbered 4 and 5, have long trunks. Line 4 is a basic north-south regional line; it’s possible some trains should branch to the Hudson Line, but most would stay on the Harlem Line, and it’s equally possible that the Hudson Line trains to Grand Central should all use line 2. Either configuration creates very high all-day frequency between White Plains and St. George, and still high frequency to both Staten Island branches, with many intermediate stations, including urban stops. Line 5 goes northwest-southeast, and has to have, at a minimum, stops at Pavonia, Lower Manhattan, Downtown Brooklyn, and then all the LIRR Atlantic Branch stops to and beyond Jamaica. Even new tunnels to Midtown can be built with the RER A concept in mind. This means more stations, for good connections to existing subway and bus lines. This is not superficially obvious from the maps of the RER A and C: if anything, the RER C has more closely-spaced stops within Paris proper, while the RER A happily expresses from La Defense to Etoile and beyond, and completely misses Metro 5 and 8. Crossrail similarly isn’t going to have a transfer to every Underground line – it’s going to miss the Victoria and Piccadilly lines, since connecting to them would have required it to make every Central line stop in the center of London, slowing it down too much. However, the important feature of the RER A is the construction of new stations in the new tunnels – six of them, from La Defense to Nation. The RER C was built without any new stations, except (later) infill at Saint-Michel, for the transfer to the RER B. The RER C’s urban stations are all inherited legacy stations, even when underground (as some on the Petite Ceinture branch to Pontoise are), since the line was built relatively cheaply, without the RER A’s caverns. This is why in my City Metric piece, I refer to the RER B as a hybrid of the RER A and C approaches: it is a coherent north-south line, but every station except Saint-Michel is a legacy station (Chatelet-Les Halles is shared with the RER A, Gare du Nord is an existing station with new underground platforms). With this in mind, there are several locations where new regional rail tunnels in New York could have new stations. I wrote two years ago about Bergenline Avenue, within the new Hudson tunnels. The avenue hosts very high bus and jitney frequency, and today Manhattan-bound commuters have to go through Port Authority, an obsolete structure with poor passenger experience. Several more locations can be identified. Union Square for line 4 has been on the map since my first post on the subject. More stations on line 5 depend on the alignment; my assumption is that it should go via the approach tracks to the Erie’s Pavonia terminal, but if it goes via Hoboken then there should be a station in the Village close to West 4th Street, whereas if it goes via Exchange Place then there should be a station at Journal Square, which is PATH’s busiest New Jersey station. On lines 4 and 5, there are a few additional locations where a station should be considered, but where there are strong arguments against, on the grounds of speed and construction cost: Brooklyn Heights, Chinatown (on line 5 via Erie, not 4), a second Lower Manhattan station on line 4 near South Ferry (especially if the main Lower Manhattan station is at City Hall rather than Fulton Street). There are also good locations for more stations on the Metro-North Penn Station Access routes, both the New Haven Line (given to line 1) and the Hudson Line (given to line 3). Current plans for Penn Station Access for the New Haven Line have four stations in the Bronx, but no connection to Astoria, and a poor connection to the Bx12 buses on Fordham Road. A stop on Pelham Parkway would give a stronger connection to the Bx12 than the Coop City station, which the Bx12 reaches via a circuitous route passing through the 6 train’s northern terminus at Pelham Bay Parkway. Astoria has been studied and rejected on two grounds: one is construction difficulties, coming from the constrained location and the grade; the other is low projected ridership, since current plans involve premium fares, no fare integration with the subway and buses, and low off-peak frequency. The first problem may still be unsolvable, but the second problem is entirely the result of poor industry practices. On the Empire Connection, there are plans for stops at West 62nd and West 125th Street. It is difficult to add more useful stations, since the line is buried under Riverside Park, far from Upper West Side and Washington Heights development. The 125th Street valley is one of few places where urban development reaches as far west as the Empire Connection. That said, Inwood is low-lying and it’s possible to add a station at Dyckman Street. In between, the only semi-plausible locations are 145th Street or 155th-158th (not both, they’re too close), and even those are marginal. All of these neighborhoods, from West Harlem north, have low incomes and long commutes, so if it’s possible to add stations, Metro-North should just do it, and of course make sure to have full fare integration with the subway and buses. The one extra complication is that there are intercity trains on this line and no room for four-tracking, which limits the number of infill stops that can support high frequency (at worst every 10 minutes). The existing regional lines in New York have very wide stop spacing within the city. It’s a general feature of North American commuter rail; I wrote about it 5 years ago in the context of Chicago, where Metra is even more focused on peak suburb-to-CBD commutes than the New York operators. In most North American cities I heartily endorse many infill stops on commuter rail. I have a fantasy map for Los Angeles in which the number of stops on inner commuter rail lines triples. However, New York is more complicated, because of the express subway lines. In isolation, adding stops to the LIRR west of Jamaica and to Metro-North between Harlem and Grand Central would be a great idea. However, all three lines in question – Metro-North, the LIRR Main Line, and the Atlantic Branch – closely parallel subway lines with express tracks. It’s still possible to boost urban ridership by a little by having a commuter rail stop for each express subway stop, which would mean 86th and 59th Streets in Manhattan and Utica Avenue in Brooklyn, but the benefits are limited. For this reason, my proposed line 4 tunnel from Grand Central down to Lower Manhattan has never had intermediate stations beyond Union Square. For the same reason, while I still think the LIRR should build a Sunnyside Junction station, I do not endorse infill elsewhere on the Main Line. That said, there are still some good candidates for infill. Between Broadway Junction and Jamaica, the LIRR parallels only a two-track subway line, the J/Z, which is slow, has poor connections to Midtown (it only goes into Lower Manhattan), and doesn’t directly connect Jamaica with Downtown Brooklyn. The strongest location for a stop is Woodhaven Boulevard, which has high bus ridership. Lefferts is also possible – it hosts the Q10 bus, one of the busiest in the borough and the single busiest in the MTA Bus system (most buses are in the New York City Transit bus division instead). It’s 4.7 km from Woodhaven to Broadway Junction, which makes a stop around Logan or Crescent feasible, but the J/Z is much closer to the LIRR west of Crescent Street than east of it, and the A/C are nearby as well. Another LIRR line that’s not next to a four-track subway is the inner Port Washington Branch. There are no stops between the Mets and Woodside; there used to be several, but because the LIRR had high fares and low frequency, it could not compete once the subway opened, and those stations all closed. There already are plans to restore service to Elmhurst, the last of these stations to be closed, surviving until 1985. If fares and schedules are competitive, more stations are possible, at new rather than old locations: Queens Boulevard with a transfer to a Triboro RX passenger line, and two Corona stops, at Junction Boulevard and 108th Street. Since the Port Washington Branch is short, it’s fine to have more closely-spaced stops, since no outer suburbs would suffer from excessive commutes as a result. Beyond Jamaica, it’s also possible to add LIRR stops to more neighborhoods. There, the goal is to reduce commute length, which requires both integrated fares (since Southeast Queens is lower middle-class) and more stops. However, the branches are long and the stop spacing is already not as wide as between Jamaica and Broadway Junction. The only really good infill location is Linden Boulevard on the Atlantic Branch; currently there’s only a stop on the Montauk Line, farther east. In New Jersey, the situation is different. While the stop spacing east of Newark is absurdly long, this is an artifact of development patterns. The only location that doesn’t have a New Jersey Transit commuter rail stop that could even support one is Harrison, which has a PATH station. Additional stations are out of the question without plans for intense transit-oriented development replacing the warehouses that flank the line. A junction between the Northern Branch and line 2, called Tonnelle in my post on The Transport Politic from 2009, is still feasible; another stop, near the HBLR Tonnelle Avenue station, is feasible on the same grounds. But the entire inner Northern Branch passes through hostile land use, so non-junction stations are unlikely to get much ridership without TOD. West or south of Newark, the land use improves, but the stop spacing is already quite close. Only two additional locations would work, one on the Northeast Corridor near South Street, and one on the Morris and Essex Lines at the Orange Street stop on the Newark Subway. South Newark is dense and used to have a train station, and some area activists have hoped that plans to extend PATH to the airport would come with a South Street stop for additional urban service. At Orange Street the land use isn’t great, since a highway passes directly overhead, but the Newark Subway connection makes a station useful. Finally, in Manhattan, the East River Tunnels have four tracks, of which Amtrak only needs two. This suggests an infill East Side station for the LIRR. There are strong arguments against this – namely, cost, disruption to existing service, and the fact that East 33rd Street is not really a prime location (the only subway connection there is the 6). On the other hand, it is still far denser than anywhere in Brooklyn and Queens where infill stations are desirable, and the 6’s ridership at 33rd Street is higher than that of the entire Q10 or Bx12. The RER A and Crossrail are not minimal tunnels connecting two rail terminals. They are true regional subways, and cost accordingly. Extracting maximum ridership from mainline rail in New York requires building more than just short connections like new Hudson tunnels or even a Penn Station-Grand Central connection. While some cities are blessed with commuter rail infrastructure that allows for coherent through-service with little tunneling (like Boston) or no tunneling at all (like Toronto), New York has its work cut out for it if it wants to serve more of the city than just Jamaica and the eastern Bronx. The good news is that unlike Paris and London, it’s possible to use the existing approaches in Brooklyn and New Jersey. The bad news is that this still involves a total of 30 km of new tunnel, of which only about 7 are at Penn Station. Most of these new tunnels are in difficult locations – underwater, or under the Manhattan CBD – where even a city with reasonable construction costs like Paris could not build for $250 million per km. The RER A’s central segment, from Nation to Auber, was about $750 million/km, adjusted for inflation. That said, the potential benefits are commensurate with the high expected costs. Entire swaths of the city that today have some of the longest commutes in the United States, such as Staten Island and Eastern Queens, would be put within a reasonable distance of Midtown. St. George would be 6 minutes from Lower Manhattan and perhaps 14 from Grand Central. Siting infill stations to intersect key bus routes like Bergenline, Woodhaven, and Fordham, and making sure fares were integrated, would offer relatively fast connections even in areas far from the rail lines. The full potential of this system depends on how much TOD is forthcoming. Certainly it is easier to extract high ridership from rapid transit stations that look like Metrotown than from ones that look like typical suburban American commuter rail stops. Unfortunately, New York is one of the most NIMBY major cities in the first world, with low housing growth, and little interest in suburban TOD. Still, at some locations, far from existing residential development, TOD is quite likely. Within the city, there are new plans for TOD at Sunnyside Yards, just not for a train station there. The biggest potential in the suburbs is at White Plains. Lying near the northern terminus for most line 4 trains, it would have very good transit access to the city and many rich suburbs in between. It’s too far away from Manhattan to be like La Defense (it’s 35 km from Grand Central, La Defense is 9 km from Chatelet-Les Halles), but it could be like Marne-la-Vallee, built in conjunction with the RER A. Right now, the busiest commuter lines in New York – both halves of the Northeast Corridor and the LIRR Main Line – are practically intercity, with most ridership coming from far out. However, it’s the inner suburbs that have the most potential for additional ridership, and middle suburbs like White Plains, which is at such distance that it’s not really accurate to call it either inner or outer. The upper limit for a two-track linear route with long trains, high demand even in the off-peak hours, and high ridership out of both ends, is around a million riders per weekday; higher ridership than that is possible, but only at the levels of overcrowding typical of Tokyo or Shanghai. Such a figure is not out of the question for New York, where multiple subway lines are at capacity, especially for the more urban lines 4 and 5. Even with this more limited amount of development, very high ridership is quite likely if New York does commuter rail right. I’ve written a lot of articles over the years about what should be done with regional rail in the New York area, focusing either on the overall shape of the system (as on The Transport Politic) or on specific aspects of the central links (as in past posts here). I’d like to synthesize these ideas into one coherent proposal. Unlike my posts on The Transport Politic, I’m going to pay relatively little attention to how to match branches for ridership, but more attention to what to do in a central region consisting of the city proper, New Jersey as far as Newark, and New Rochelle. I will also indicate things that can be done to keep construction costs under control for a plan that includes 30 kilometers of urban and underwater tunnel, about six times as much as the planned tunnels across the Hudson. The most important principle for infrastructure planning in developed countries is organization before electronics before concrete. In New York, it’s possible to squeeze some extra capacity out of the first two: notably, the LIRR and Amtrak together only run about 40 trains per hour into Penn Station from the east on four tracks, whereas the maximum capacity is about 50, and this is before trains are diverted to the East Side Access tunnels to Grand Central. The LIRR’s bottleneck is not the East River Tunnels, but the platforms at Penn Station, and this means it’s possible to use improved operations, including through-running, to squeeze extra capacity even before East Side Access opens. However, the biggest bottleneck in the region is from the west, across the Hudson, and there, present traffic peaks at 24-25 trains per hour on just two tracks. I know of limiting cases in which mainline operations achieve about 30, using moving-block signaling on captive tracks (e.g. the RER A, which shares tracks with nothing else in its central segment), with one example that uses fixed blocks (the shared RER B and D tunnel achieves 32). Here, concrete is unavoidable, so new tunnels are required. In addition, providing service to more points than Penn Station, or Grand Central for commuter lines connected to it, requires new tunnels as well. However, this new infrastructure should be built economically. The posts I linked to in the initial paragraph of this post provide some ideas, including the use of large-diameter tunnel boring machines to reduce station construction costs, and the use of the existing station cavern at Penn Station. This should be paired with seamless fare and schedule integration, including through-routing, and a fleet replacement plan to get rid of locomotive-hauled trains and replace them with EMUs (electrifying unelectrified branches as needed). Subject to the requirement for new infrastructure, New York should remember that it’s a major city, and as such, it’s capable of supporting multiple independent commuter lines. Paris has five RER lines, of which only the B and D share tracks, and only between one pair of stations, on top of several major commuter lines disconnected from the RER network. It’s better to keep the map relatively coherent, so that one central trunk will split into several outer branches, but nearly all outer branches will feed into consistent central trunks. (As an example, the London Underground’s deep-level lines’ branching is coherent, while the New York subway’s mostly isn’t, with the E, F, M, and R trains running on what’s technically a branch and then diverging to three different Manhattan trunks.) This simplifies the junctions that need to be built just outside the city core, and also makes the network easier to remember. There should be a new pair of tunnels between New Jersey and Penn Station, parallel to and south of the existing tunnels. Those tunnels should then continue to Grand Central. This is the core of ARC Alternative G, which was removed from consideration in the original ARC project for reasons that were never explained adequately (Stephen Smith has been making freedom of information requests for years). However, unlike Alt G, it should not include new railyards in Manhattan, as those belong in areas where land is cheaper, nor should it include a loop for trains from the Erie lines to get to Penn Station. The lynchpin of the plan is not the tunnels to Penn Station, which are already on the political radar in the form of the Gateway Project, albeit at a large multiple of an acceptable cost, due to such frills as new Penn Station tracks. Rather, it’s a new set of tunnels, meeting at Lower Manhattan in the vicinity of Fulton Street, going in four directions: north to Grand Central, south to Staten Island under Lower New York Bay, northwest to New Jersey via the Erie Railroad’s old Pavonia terminal, and southeast to Brooklyn to the Flatbush Avenue LIRR station. Using a double-O-tube large-diameter TBM, the Fulton Street station should feature cross-platform transfers, large banks of escalators to the street, and, to reduce costs, no station structures outside the tunneled station, putting timetables and ticket-vending machines on the street. All connections should be to Grand Central’s existing station and not the new East Side Access cavern, as the cavern leads only to the LIRR, which is already connected with both Penn Station and Flatbush Avenue. The existing tracks connect to Metro-North, which is not. A possible additional tunnel in the far future would connect Hoboken with Grand Central’s new cavern, via Union Square. This is only in case the existing lines become congested. Current commute patterns make such congestion very unlikely, but things could change if, as a result of the new capacity, more people choose to live in suburban North Jersey and work in Manhattan. There should be five lines running through Manhattan, without any track-sharing between them, and one using East Side Access and terminating in Manhattan. I am going to try using consistent numbering, different from the order I used in my posts on The Transport Politic, in order to group the lines using Penn Station and the lines to Lower Manhattan separately. Line 1 is the existing mainline. Its inner route goes from Secaucus Junction to Sunnyside Junction, via the existing tunnels to Penn Station. Intercity trains use it (and should continue doing so), but most traffic will always be on commuter rail. Beyond Secaucus, trains can go to either the Northeast Corridor or the Morris and Essex Lines; to simplify junctions, most trains should use the Northeast Corridor (including the Raritan Valley Line, which splits past Newark). Beyond Sunnyside, they can go to the LIRR or the Northeast Corridor; to ensure adequate capacity for intercity trains while still providing service to the eastern Bronx, trains should use a mixture; in the long run, four-tracking everything north of Hell Gate Bridge will be necessary. It may be best to dedicate Port Washington trains to this line. At Penn Station, it uses middle-numbered tracks. Line 2 uses the new tunnels to Penn Station and Grand Central. Its inner route goes from Secaucus to Penn Station, Grand Central, and Harlem-125th Street, splitting into branches thereafter. Most trains should go to the New Haven Line, since Line 1 could never provide adequate traffic for it; the rest should go to the Hudson Line – see below for Line 3. At the New Jersey end, it should run to a mixture of Northeast Corridor trains (including to the North Jersey Shore and Raritan Valley) and Morris and Essex trains, as required by demand. At Penn Station, it uses low-numbered tracks, potentially just 1-4. I expect it to be the most crowded, because of the service to both primary Midtown Manhattan stations. Line 3 uses the Empire Connection, realigned tunnels to Penn Station, and the northern pair of the East River Tunnels to reach the LIRR. Its inner route goes from Yonkers to Penn Station and thence to Sunnyside. Intercity trains to Upstate New York use this line, but there are fewer of them than on the Northeast Corridor. Beyond Yonkers it can only go on the Hudson Line, so most Hudson Line trains should use it rather than Line 2. At the LIRR end it should run alongside trains to the East Side Access tunnel; as the splits are far to the east of Sunnyside, it may be prudent to have each branch serve both it and East Side Access, but in either case, timed East Side Access/Line 1 transfers at Sunnyside are necessary. At Penn Station, it uses high-numbered tracks. I expect it to be the least crowded, since to the west it only reaches one commuter line, one whose present traffic is moderate. Line 4 is the main north-south line, from Staten Island (both the existing Staten Island Railway and the North Shore Branch) through the underwater tunnel to Fulton Street, Grand Central, and Metro-North. North of Harlem-125th Street, it can connect to any line, but I think the Harlem Line is the most coherent, as the only Metro-North line that is not needed for lines that don’t go to Grand Central. I expect it to be very crowded with inner-suburban and outer-urban traffic, as it serves Staten Island and underserved neighborhoods of the Bronx and the suburbs to its immediate north. Line 5 is the combination of the Erie Lines, and possibly also the Northern Branch and the West Shore Line, and the LIRR’s Atlantic Branch, via Pavonia and Flatbush. For interlocking simplicity, all trains should go to one or two lines beyond Jamaica, ideally the Atlantic and Montauk Lines (the existing turnouts already favor trains from the Brooklyn Atlantic Branch continuing along the branch to Far Rockaway and Long Beach), leaving the Main Line to Line 3 and East Side Access. As there are five possible branches in New Jersey – the Northern Branch, the West Shore Line, the Pascack Valley Line, the Bergen County Line, and the Erie Main Line – frequency would be limited if all were used, so it may be best to choose just three. Here is an unlabeled map of the five lines, with only inner branches shown; the decision of what station to terminate branches at has nothing to do with the desired service pattern, and is purely illustrative. A potential Line 6 would take in all Morris and Essex lines, go to Hoboken, cross into Manhattan via a new tunnel with an extra stop at Union Square and then go to Grand Central and East Side Access; as discussed above, it’s omitted due to its very long-term nature. I have discussed what to do with the Fulton Street Station. Penn Station is more complicated. The easiest thing to do is nothing, beyond new tunnels. There would be many platform tracks, two per access track for Line 2 and more than two for Lines 1 and 3; Line 3 would involve difficult switching moves and slow speeds through the station. Line 1 is the most important priority for allowing intercity trains to serve the stations with few (ideally no) diverging moves at turnouts, to maintain speeds. To avoid platform congestion, especially on Line 2, more staircases and escalators should be installed. This, however, clutters the narrow platforms. The second possibility is to pave over tracks to widen the platforms. I vacillate between preferring paving over pairs of tracks to create very wide platforms, and paving over every other track to create wider platforms at which trains can open doors on both sides. Right now I lean toward the former, as it would allow reusing preexisting escalators: the platforms currently have single-direction escalators as they’re too narrow for an adjacent pair of escalators, one per direction, and merging two platforms would be the easiest way to allow wider escalator banks. The most expansive solution is to rebuild the station’s track level. There is an RPA study Penn Design study in that direction. For optimal passenger usage, the two concourse levels would be replaced by one, and the station’s 21 tracks would be reduced to 12, facing six 15-meter-wide platforms; the platforms’ eastern ends would be shaved slightly, to allow longer curve radii heading from the Lines 2 and 3 tunnels with simple turnouts, each tunnel track turning into two station tracks facing the same platform. In principle, it can be sequenced to shut down parts of the station in succession: first the southern tracks (New Jersey trains would be immediately interlined with Northeast Corridor and LIRR trains for a combination of Lines 1 and 2), then the northern tracks (the LIRR would have East Side Access by then), and finally the remainder of the central tracks. The bulk of the work on the central track could be done in conjunction, first removing the platform between the existing tracks 11 and 12 and then realigning tracks from the center outward. I want to clarify that I do not support the most expansive solution, as it is likely to cost billions of dollars. It would create a nice Penn Station for train travelers. Those 15-meter platforms could have 6 escalators side by side with not too much obstruction, and 4 with practically none (the widest escalator is 1.6 meters wide outer end to outer end, with 1 meter used for the moving stairs). Reducing the two concourses to one would allow taller ceilings throughout, and redesigns of passageways for maximum passenger throughput. The only problem: it would be extremely expensive. I bring this up only because the Municipal Arts Society and the RPA have teamed to propose a multi-billion dollar remake of Penn Station above track level, with high aesthetic value and zero transportation value. In addition, Amtrak wants to move its passenger facilities one block west, in the wrong direction, which has negative transportation value. If there has to be a redo of the station, it might as well be one that improves it at track level as well, rather than just making it pretty from the outside. The ideal phasing is “as soon as money becomes available.” There is a tendency in the US to be overly cautious about everything and chop projects into little pieces, in the name of prudence. It’s always easy to show one’s moderation by chopping a fixed amount of money from every proposal (quintessential moderate Senator Olympia Snowe was famous for this) and by funding many projects by small amounts. These small projects then fail because of reduced network effects or sometimes higher costs due to smaller orders. The tunnels I proposed in this post sum to about 30 kilometers. These 30 kilometers are objectively difficult to build. The tunnels for Lines 4 and 5 of this proposal go under wide rivers and a bay, and once they reach Manhattan land they have to go under the entire Lower Manhattan subway network. Half a billion dollars per kilometer would be a good deal: Crossrail is more than a billion dollars per double-track tunnel kilometer, assuming there is nothing to build except tunnels (which is far from true), while Crossrail 2’s cost range is $600-850 million per km (see also my first comment in the link). London is a high-construction cost city, but New York is even higher-cost; building a line for London’s costs would be a major achievement for New York. Bear in mind that Amtrak thinks the Gateway Project alone would be $16 billion. When I propose to build an entire regional rail network for perhaps $20 billion (in 2010 dollars, not year-of-expenditure dollars), based on what it would cost in other cities, I am not taking into account the bloat that leads to high costs in New York. At the per-km costs Amtrak thinks are appropriate for what would be one of the simpler tunneling projects for this system, this is plain unaffordable. The lower-end cost I’m proposing is for a project without any frills. It includes a bare minimum touch for Penn Station – simpler interlockings at places and some extra access points, but no more. It includes no Sunnyside decking or other redevelopment, which should be funded separately in any case. (When people build highways, do their projected cost figures ever include the construction of the suburban subdivisions they’d sprout?) It doesn’t include electrification of branches, although that is cheap enough as to be well within the uncertainty in even a first-order estimate. It doesn’t even include rolling stock, although the large preexisting fleet of decent EMUs means there’s no need for immediate fleet replacement as on the MBTA and other diesel-hauled railroads. The only thing this project does include is more paths for more commuter trains to serve Manhattan and other regional job centers. This post mainly responds to an argument made by Jim in comments that the core portion of the Northeast Corridor is New York-Washington, and New York-Boston is more expensive and less useful. The Northeast Corridor has two halves: New York-Philadelphia-Washington and New York-Boston. The southern half is the more important one: according to PDF-page 41 of the Master Plan it carries 70% of the traffic, and the top city pairs are New York-Washington and New York-Philadelphia, both substantially larger than New York-Boston. Although the corridor is always treated as a single line, it is worth checking the value of upgrades separately, especially because the southern half is straighter and would take less investment to bring up to full high-speed rail standards. However, even with such a disaggregation, New York-Boston is a valuable route, with more potential benefits than any other in the US except New York-Washington. For a first filter, we can look at city populations. New York’s size is such that even much smaller cities can be fruitfully connected to it by greenfield HSR. Seoul, of comparable size to New York, is connected to Busan, which is slightly smaller than Boston and slightly farther apart from Seoul than Boston is from New York; the intermediate cities, Daejeon and Daegu, are somewhat larger than New Haven and Providence. Total ridership on the Seoul-Busan segment of the KTX is about 30 million per year, and Korail appears to be making profits on the line, despite very high construction costs coming from heavy tunneling (about 40% of the route). The first filter alone warrants further investigation of the route, even independently of New York-Washington. The costs of New York-Boston, while higher than those of New York-Washington, are not very high. We can put much of the New Haven Line in the “too hard” basket initially, but instead focus on high speeds between New York and Stamford and between New Haven and Boston and somewhat higher speeds between Stamford and New Haven than today. The average speed that can be squeezed with such investment is comparable to that of the KTX today, before the high-speed segments through two intermediate cities have been completed; those segments can then be compared to tackling Stamford-New Haven. Of course, while adequate, is still nowhere nearly as good as what can be done on New York-Washington. It’s not just that this segment connects New York to two different cities the size of Greater Boston. Although today New York-Philadelphia has higher ridership than New York-Boston, this may well be reversed in the presence of full-fat HSR, since cutting a 1:05 trip to 0:38 does not provide the same competitive boost as cutting a 3:30 trip to 2:00, and Amtrak’s primary competition is highways rather than planes. Rather, the benefits of New York-Washington are more in the distribution of the secondary centers. The biggest satellite metro area of Washington is Baltimore, on the line. Of Boston’s satellite metro areas – Providence, Worcester, and Nashua-Manchester – at most one can be served by any semi-reasonable HSR alignment. Philadelphia-Washington provides an additional market to be served. Washington’s population growth is much faster than that of the rest of the Northeast, and is comparable to that of the Sunbelt. At the same time, there are benefits to building both lines; since under a phased program that built one first and then the other New York-Washington would be first, those benefits should be counted as benefits of New York-Boston. The biggest one is service through New York. Boston-Washington is a major air market: the O&D passenger volume between the Boston and Washington areas is 3.1 million a year; this is more than Boston-New York and New York-Washington combined, and Boston-Washington is both Boston and Washington’s busiest air city pair. In general, Boston-Washington and Boston-Philadelphia are located at more favorable ranges for HSR’s competitiveness than New York-Boston and New York-Washington, on which the trip time advantage versus cars and buses is smaller. If we take Boston-Philadelphia and Boston-Washington and slightly more than double the size of today’s air market – the same ratio of present-day HSR traffic to pre-HSR air traffic between London and Paris – we get an additional 9 million passengers a year, small compared to the possibilities of the other city pairs but non-negligible. – Traffic purely south of New York justifies rolling stock that could in principle achieve much higher speeds north of New York. – Because of certain capacity problems, both real and imagined, a few strategic bypasses and (near Boston) commuter rail modernization can have outsized intercity trip time benefit relative to the cost. A high-speed train that gets stuck behind commuter trains pulled by diesel locomotives does Boston-Providence in about 35 minutes. One that shares tracks with punctual modern EMUs can do the same in 20. – At low levels of infrastructure investment, the cost of new rolling stock can be sizable compared to the cost of infrastructure. Half-hourly service with 16-car trains, one possible initial service plan, costs $250 million times the one-way Boston-Washington trip time in hours including turnaround time, plus spare ratio. 15-minute service requires double that cost, naturally. None of the New York-Boston projects, not even “buy the MBTA better trains,” flips to negative cost this way, but some have lower cost as a result. – Shared-track HSR requires very good punctuality. Coming south from Boston, trains have no reason to be off-schedule in New York – Metro-North is reasonably punctual (though not enough for HSR) and both between the Rhode Island/Massachusetts state line and New Haven and between New Rochelle and New York Amtrak owns the tracks and runs the most trains – but the bypass and junction separation will help further. Coming north from Virginia there are much bigger problems, but trains can dwell arbitrarily long in Washington for schedule buffer, which they can’t in New York. What this means is that it’s best to phase Northeast HSR investment throughout the entire corridor. New York-Washington should have the priority because it’s cheaper and has more traffic potential, but unless for some reason there is no money (not even about $4 billion for immediate improvements plus a little more for a bypass), parts of New York-Boston should be in the first phase. Arguably, even true branches, such as to the Keystone Corridor and Springfield, can get through-service early. Those do not have the ridership potential of the core route, but electrifying New Haven-Springfield to run trains through, and programming extra trains for Keystone, can be done within a few years. The limit perhaps is only rolling stock, or more precisely what to do with the electric locomotives that would become obsolete (they already are, but are a sunk cost, and buying new HSR trainsets now becomes an additional one-time cost). I don’t normally pedestrian-observe cities that I’ve been to so many times, and New Haven is the US city I’ve spent the most time in other than the two I’ve lived in. But my last visit, in which I looked at the closing time of each store and found it compares more favorably with Providence than I’d thought, led me to think why I have such a visceral response to New Haven’s urbanism. The parking. It hurts. Providence’s Downcity has parking garages and surface lots, but it has nothing on New Haven there. New Haven’s Route 34 stubway is only an actual road for two and a half blocks west of State Street – 800 meters of actual freeway. Beyond that the full width of the block is occupied by a multistory parking deck for 250 meters, passing over York Street and making walking between downtown or most of Yale and Yale-New Haven Hospital unpleasant. Farther out there are two full blocks, or 600 linear meters, of surface lots. On both sides, the parts of Route 34 used for moving cars are also flanked by surface lots. Although Union Station is located outside city center, and the area immediately to its east is either empty or low-value, the station’s overflow parking lots are located between the station and downtown, on the downtown side of Route 34. There are special shuttles between the train station and the parking lots, and other shuttles between the train station and Yale. It makes Providence Station and Providence Place look like models of megaproject-city integration. To solve that particular problem, New Haven is proposing a circulator streetcar with practically no use other than a parking lot shuttle on rails. Even inhabited buildings are often surrounded by immense amounts of surface parking. Immediately north of the elevated parking garage over York, there are several towers in parking lots. Even lower-rise housing is frequently surrounded by continuous parking; this is true of most blocks flanking State Street within walking distance of the State Street train station. What’s jarring is not just the percentage of space devoted to parking, but also the size of continuous parking lots; the more intact residential neighborhoods of both New Haven and Providence have small lots behind or between houses, rather than multiple continuous hectares of parking. It’s this preponderance of unlit parking that gives the city a post-apocalyptic feel. Discounting the parking, the city is surprisingly monocentric. Most of the university and the secondary urban destinations cluster near downtown. Generally they’re west of the office towers – just far enough to avoid creating a true mixed-use neighborhood anywhere – but they’re theoretically within walking distance of everything. It’s not like the multiple cores of Providence and Cambridge. The upside is that Chapel Street doesn’t depopulate at 7 pm the way Downcity does; the downside is that it’s still nowhere as nice as Thayer or Wickenden Street and completely lacks their small cosiness. It’s too bad, because there is a lot of usable space in New Haven that would make for great development, and also make the rest of the city more livable if built up. The individual buildings that aren’t recent urban renewal projects are fine; there just need to be more of them. Some, though by no means all or even most, of the pedestrian-hostility will go if Route 34 is removed as planned. But the current plans call for the first block removed to be 50% replaced with a parking garage. Moreover, there do not seem to be plans to tear the elevated parking garage over York, even though it’s York and not the streets intersecting the freeway proper that connects to the hospital. The problem, I believe, comes from viewing freeway removal as yet another urban renewal program, on a par with one-way streetcar loops, sterile cultural centers, and other universal failures. It’s a preference for the iconic over the mundane that leads New Haven to spurn the idea of removing the freeway and the garage, not mandating any parking, and selling the land in small lots to allow for independent businesses. Big things almost invariably present a blank street wall. It’s not impossible for big entities to coexist with reasonable urbanism – Brown’s own buildings aren’t the best, but they don’t prevent Thayer Street from more or less working – but big buildings in low-traffic areas do not. A skyscraper in a downtown area with enough demand for it will work – it can have retail in its first floor facing the street, as the Empire State Building does, and the adjacent blocks will also be able to supply urban amenities. A skyscraper surrounded by nothing will not. Neither, for that matter, will a four-story facility occupying half a block; those need to be somewhere, but New Haven has enough space for them already and has no reason to prefer them to blocks with multiple separate buildings owned by different entities. The end result is that New Haven is likely to stay bad. The suburbanites think it has a shortage of parking; thus, the city builds more for them, instead of realizing that a city will always have a shortage of parking and if it is accused of something it might as well do it and cater to people who it can satisfy. It’s great for cars – even more of the region will be open to them to the exclusion of anyone who uses other modes of transportation. It’s just bad for people. MTA Chairman Joe Lhota recently proposed to through-route commuter rail lines in the New York area, as was proposed in the past by the RPA, the Institute for Rational Urban Mobility, and more recently myself. Lhota proposed other, less flashy ideas for integration, including better track sharing at Penn Station and lengthening platforms to accommodate 10-car trains. Although a network that looks like my proposal should still be the goal for the next 20 years, there are several things that can be done in the very short run. None is do-it-tomorrow immediate, but neither does any require very difficult modification of equipment or organization or significant infrastructure investment. Most should not require extensive studies. Note that this is not a wishlist of the most important commuter rail reorganization projects in the region. Many of those reorganizations do not have anything to do with interagency integration, and are therefore not included. Only projects that are very cheap and would come from or benefit integration are on this list. 1. Integrated ticket machines at Penn Station. This requires the physical tickets on New Jersey Transit to look like those on the LIRR and Metro-North (and thus some modifications to the fare barriers at Secaucus and Newark Airport), and some reprogramming of ticket machines, but no change otherwise. Ideally a ticket from (say) Hicksville to Newark should cost less than the sum of tickets from Hicksville to New York and New York to Newark, to encourage reverse-peak traffic, but strictly speaking the discount is not needed. Amtrak and commuter rail machines should also be integrated, though the physical tickets can still be different if switching over is too hard. 2. Integrated concourses at Penn Station. This means treating the upper and lower concourses as belonging to all three railroads. This requires Amtrak to give up its single-file queuing and accept that people already can walk around and get to its trains from other railroads’ turfs. Trains should be announced on all concourses, and all access points to a platform should be clearly signed with the next train’s type and schedule. 3. Timed transfers. Although a clean integrated timetable is impossible, because trains interline on some inner segments to increase capacity, a partial version is still possible. What this means is that, with hourly off-peak service on each branch, Morris and Essex trains should arrive at Penn Station just before the hour, as should one of the several hourly trains on the New Jersey side of the Northeast Corridor, and then two or three branches going to the east (say, to New Haven and Port Washington, and on one additional LIRR line for service to Jamaica) should leave just after the hour, with the tightest connection done cross-platform. This would make trips from New Jersey to JFK and from Long Island to Newark easier, and the choice of services to participate in the system should be consistent with even spacing on interlined trunks. 4. Modification of rolling stock. Metro-North’s M8s can run under 60 Hz catenary and third rail, but unfortunately not 25 Hz catenary; as lower frequency requires a larger transformer, modifying the trains to run on the New Jersey side of the Northeast Corridor may be too hard in the very short term (though not in the medium and long terms). However, NJT’s ALP-46 locomotives and Arrow EMUs can run on 12 kV 25 Hz and 25 kV 60 Hz catenary, and thus modifying them to run on Metro-North’s 12 kV 60 Hz catenary is easy, allowing them to run from the NJT network to the New Haven Line. Unfortunately, because locomotives accelerate more slowly than EMUs and the Arrows are quite old, they do not have very good performance for short-stop service, for which through-running is the most useful. 5. Voltage change on the Northeast Corridor’s New Jersey side to 25 kV 60 Hz. This voltage change was done to the Morris and Essex lines and much of the North Jersey Coast Line. It is somewhere on Amtrak’s wishlist of projects, but I do not know how high it is. This allows M8s to run through, ensuring the better rolling stock is available for the service that needs it the most. It may possibly be bundled with Amtrak’s installation of constant tension catenary south of New Brunswick to reduce costs. Since this eliminates the need for 25 Hz transformers in the future, this meas future NJT rolling stock would be lighter. 6. Depending on 4-5, rolling stock sharing along interlined services. In practice this means M8s on local Northeast Corridor services, which would also allow adding and serving infill stations in New Jersey (for example, more regular service to North Elizabeth, and perhaps a station at South Street in Newark), and Arrows and locomotives on express services from Penn Station and New Jersey to New Haven. It is my belief that all of the above, possibly except #5 and #7, are feasible within months or at worst a very small number of years, and would not require additional environmental work. Even #5 and #7, which are more expensive, are still close to two orders of magnitude cheaper than a full through-running plan with new tunnels serving Lower Manhattan. The medium term is more expensive – perhaps an order of magnitude less than the full program rather than two – and would include further modernization, allowing full through-service on every line and more efficient equipment utilization. It can also assume friendlier regulations, which a snap integration cannot, and this in particular means better rolling stock in the future and higher speeds even with existing rolling stock. Clockface schedules and frequent off-peak service would allow planning infrastructure repairs and upgrades around specific schedules. For example, the current local Stamford-Grand Central schedule is 1:06, but an express train I recently took from New Haven came to Grand Central more than 10 minutes ahead of schedule, suggesting excessive padding; minor upgrades should allow an M8 to do Stamford-New York in an hour minus turnaround time making local stops, and more ambitiously New York-New Brunswick in 45 minutes minus turnaround time. Lhota can’t do much in the long term, because this requires an enormous investment into concrete, a political decision and a longer-term one than Lhota’s term as MTA chair. However, he can both implement the above seven points within his term, and also set in motion various work rule reforms and small-scale capital project planning and apply for the requisite FRA waivers to permit the medium-term reforms to succeed. Let me preface this post by saying that there should not be any high-speed trains between New York and New Rochelle, except perhaps right at the northern end of the segment. However, to provide reasonable speeds from New York to Boston, it’s desirable to upgrade the maximum speed between New York and New Rochelle to 200 km/h or not much less. The subject of this post is how this can be accommodated while also permitting some regional rail service, as proposed by the MTA. There are two reasons to bundle the two. First, some of the work required could be shared: for example, new stations could be done at the same time as rail and tie replacement. And second, the presence of both upgraded intercity rail and regional rail on the line requires some four-tracking and schedule optimization. The physical infrastructure required for boosting speeds within New York City is fairly minimal by itself. The right-of-way in the Bronx has some curves but they are not very sharp and can be somewhat straightened without knocking down buildings, and even the curves in Queens and on the Hell Gate Bridge, while unfixable without major viaduct modification, are not terrible if superelevation is high and tilting is enabled. A big question mark is what the maximum speed permitted by the physical layout of the East River Tunnels is. Current speed is 97 km/h (60 mph), but top speed today in other sections of the network are below those achieved decades ago (for example on Portal Bridge), and trains with specially designed noses, as the Shinkansen rolling stock is, could potentially go even faster. Regardless, it is not important for HSR-regional rail integration, since the East River Tunnels have no stops and will be running far under capacity once East Side Access opens. Thus, all travel times in this post are between New Rochelle and Sunnyside Junction, which is notionally considered to be located at 39th Street. This is a 25-kilometer segment. 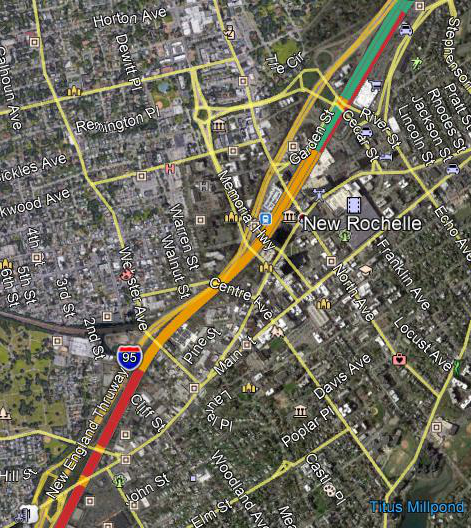 Another question mark is what the speed limit on the S-curve south of New Rochelle is. Currently the limit is 48 km/h (30 mph). Raising it requires grade-separating the junction between the NEC and the current New Haven Line. It can be raised further via curve straightening, but the question is how much eminent domain can be done. The maximum radius that can be achieved with minimal or no eminent domain is 700-800 meters. Some further eminent domain may be required to have this curve start far enough from the southbound platform that full 200 mm superelevation is achievable without subjecting local train riders to too much cant excess. For comparison, slicing through New Rochelle and the Pelham Country Club allows essentially eliminating the curve and allowing maximum speed through the area, which taking surrounding curves into consideration is about 240 km/h. Even the above travel time figures require some four-tracking, independently of capacity, in order to limit cant excess. Unlike the Providence Line, the Hell Gate line has some curves right at potential station locations – for example, the Hunts Point stop is located very close to the curve around the Bruckner Expressway, and the Morris Park stop is located in the middle of a curve. The Bruckner curve radius is about 500 meters, and 200 mm superelevation would impose 80 mm cant excess on even a fast-accelerating commuter train (1 m/s^2 to 72 km/h), and an uncomfortable 140 mm on a slower-accelerating one (0.5 m/s^2 to 51 km/h). The Morris Park curve is even worse, since it would impose a full 200 mm cant excess on a stopped train. So we should assume four-tracking at least at the Morris Park station, which is located in the middle of a curve, and Hunts Points, and potentially also at Parkchester. Now, a local train would be stopping at New Rochelle and four stops in the Bronx, and should be stopping at Sunnyside. Although a FLIRT loses only about 75 seconds from a stop in 160 km/h territory, assuming 30-second dwell times, the M8 is a heavier, slower-accelerating train, and for our purposes we should assume a 90-second stop penalty. This means that, counting New Rochelle and Sunnyside together as a single dwell-free stop (they involve one acceleration and one deceleration in the Sunnyside-New Rochelle segment), local technical travel time is 18:15, about the same as what Amtrak achieves today without stops but with less superelevaiton and inferior rolling stock. Now, 18:15-9 = 9:15, 9:15 times the schedule pad factor is 9:54, and modern signaling allows 2-minute headways up to 200 km/h; thus we can accommodate 4 tph intercity and 4 tph local Metro-North without overtakes except at New Rochelle and Sunnyside. There is only one problem with the no-overtake scenario: the MTA plans on a peak traffic much higher than 4 tph, in line with the New Haven Line’s high demand. It’s planning on a peak of 6-8 tph according to what I’ve read in comments on Second Avenue Sagas. This naturally breaks into 4 tph that make local stops and 4 that do not (though my suspicion of MTA practice is that it wants fewer than 4 local tph); if there are fewer than 8 trains, one slot could be eliminated. Let’s look then at a 4/4/4 scenario. Assume that trains depart Sunnyside in order of speed – HSR first (passing rather than stopping at Sunnyside), then express Metro-North, then local Metro-North. A local train will be overtaken first by the following HSR, and then by the following express. If we could move the overtake point to New Rochelle, the local would not need to wait for trains to pass it. In reality, 4/4/4 means the local departs Sunnyside 4-5 minutes after the HSR train passes it, and has 9 minutes of time penalty before being overtaken again. If the stop penalty could be reduced to 75 seconds, then the overtake could be moved to New Rochelle, demonstrating the use of top-quality rolling stock. But the M8s are good enough for many purposes, and therefore we will not assume a noncompliant replacement, unlike in the case of the MBTA, whose rolling stock is slow and very heavy. With 9 minutes of time to make up, it’s tempting to have an overtake at a four-tracked Co-op City station. But then the local would have to be overtaken by two trains in a row, and moreover the two trains would become quite separated by then due to differing top speeds, and this would force a penalty on the order of 6 minutes. I claim that the best would be to four-track a segment between two or even three stations; the right-of-way is wide enough anyway. In addition, the Morris Park curve could be straightened if the Eastchester Avenue overpass were modified, and doing this in conjunction with four-tracking would be cheaper than doing each alone. Under this option, the local would leave Sunnyside much later than 2 minutes after the express, just enough to be overtaken by HSR at Morris Park. It would then keep going to Co-op City until overtaken by an express. This would essentially save about 2.5 minutes out of the 6 in penalty, since the train would be in motion for that time. Last week, the MTA again floated proposals for connecting Metro-North to Penn Station once East Side Access comes online and frees track space currently used by the LIRR. The New Haven Line is to be connected to Penn Station via Northeast Corridor trackage that only Amtrak uses today, with four new stations in the Bronx. The new station locations include one near Co-op City, a dense middle-class housing project that is underserved by transit, and three more neighborhoods that are inconveniently between the 5 and 6 or on the wrong side of a freeway. In sum, it is a positive development. However, since the New Haven Line already has a Manhattan terminal at Grand Central, this project involves splitting the line in two in its inner section. Thus, frequency will be cut in half, unless there is extra service added north of the merge point at New Rochelle. At the peak, this is not a very big problem, since the New Haven Line runs 20 trains into Grand Central between 8 and 9 am every weekday; although this is misleading since most stations are only served by a small subset of these trains, it is not difficult to have trains make a few more stops to restore the existing frequencies. The problem is off-peak service. The current pattern is one train per hour serving stations north of Stamford and running nonstop between Stamford and Harlem-125th, and two Grand Central-Stamford locals per hour in the weekday off-peak and one on weekends. While poor by any international standards, the service afforded to the lower New Haven Line is tied for best in the US with just a handful of lines with half-hourly off-peak service. Splitting frequency in half would be a disaster for such service, to say nothing of not being useful to regional riders in the Bronx. Moreover, adding service just so that it can be split south of New Rochelle is counterproductive: the greatest need for frequency is close to the center rather than in the suburbs, because the shorter the trip time, the more pronounced the effect of a long wait time is. I claim that the best way to compromise on frequency under the current service paradigm is to run short-turning trains terminating at New Rochelle, with timed connections. Since some passengers prefer a one-seat ride, half the local trains should serve Penn Station and half should serve Grand Central. 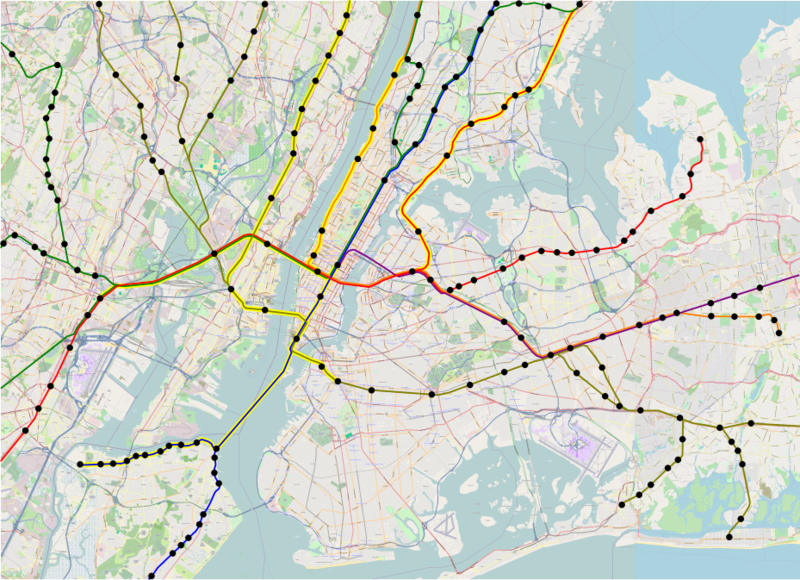 In other words, frequency should be split among the two Manhattan destinations, but each branch should have a short-turning train connecting with the other branch’s trains. Express trains should make a station stop at New Rochelle with a reasonable connection from the local trains, but should otherwise only serve one destination. Then, Grand Central is the better destination for express trains, since it minimizes interference with intercity trains. The alternative is to turn New Rochelle-Penn Station into a modernized regional rail line, run somewhat independently of the rest of Metro-North, with through-trains from the rest of the New Haven Line only at rush hour. Maybe select few off-peak trains, no more than 1 per hour, could extend to Stamford. This requires a change in paradigm; it cannot be done with the current staffing levels or turnaround times, but since it’s a service expansion, it’s plausible if unlikely that the union will accept reduced staffing, in line with best practices. – Trains go from New Rochelle to Penn Station and beyond, to New Jersey. Through-service to the Hudson Line via the Empire Connection avoids agency turf battles but is less useful for passengers. They can hook into existing services and go all the way to Trenton and Long Branch, or provide new service and only go as far as Newark. – Minimum off-peak frequency is one train every 15-20 minutes, or perhaps 30 late at night. 10 is aspirational, if the service proves popular. – Fares are integrated with local transit. This means intra-city trips cost the same as subway or not much more, and in either case, transfers to the subway or the buses are free. If people can ride trains and a ferry from Tottenville to Wakefield on one fare, people should get to ride direct from Co-op City to Penn Station on one fare. – Trains make stops that interface with other transit options. A Sunnyside stop meeting with the LIRR is a must. In addition, if the grades permit, there should be a stop in Astoria meeting the subway, and perhaps one in Port Morris, so that the trains can offer fast frequent service between Queens and the Bronx. Perhaps there should also be a restored station meeting buses from City Island. The Sunnyside stop has value no matter what: for one, it allows trains to Penn Station to also work as Grand Central trains, making the transferring process easier to implement. The other extra stops are not really useful unless commuter rail is made an attractive option for local trips – in short, an S-Bahn or RER rather than a traditional American commuter service. I hope to discuss compatibility with modernized intercity trains tomorrow. Although half-hourly service is so infrequent there is no real interference with intercity trains, more frequent service could pose problems. This is not an issue if Amtrak is not modernized: the speed limit south of New Rochelle is at most 160 km/h and even that is only between the Hutchinson River and Pelham Manor, with 100-110 km/h on the rest of the line. Thus the only speed difference between regional and intercity trains comes from making station stops, and a glance at existing schedules shows that when the top speed is 130-140 km/h trains lose about 1.5 minutes per stop. Of course high-powered noncompliant trains lose much less time, but for the purposes of running punctually on a shared line, the M8s are good enough. Losing 6 minutes from the four planned station stops is not a problem even with the proposed peak frequency, once one remembers that most peak trains are not going to stop in the Bronx at all.